Hi ,I would like to go to Kathmandu . I want to know if anyone has been there recently, because I would like to know if you know any clean and safe restaurant Aahahahahah!!! 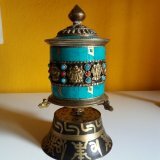 Do you know any good Tibetan doctor (name, where is, etc..) ? What should I bring with me of indispensable for a place like kathmandu? I want to buy a thanka. How much it costs( in npr) and where to buy it ? Could you give me some advice in general ? You want to go to Boudha. That's where all the Tibetans are. The Garden Restaurant in Boudha is clean and safe. Never had a problem there.The Vietnanmese restaurant on the kora is also reliable. For snacks and stuff, there's Toast. Actually, these days, most of the restaurants on the kora are clean and safe. You can get Chinese, Nepali/thali, Japense, Italian. A far cry from the old days. The Khasti Hotel is a nice, inexpensive hotel. Clean and run by friendly and helpful people. If you can afford/want to afford something a little more, Rokpa Guesthouse is wonderful. Quiet, safe, and reliable. They have their own kitchen/dining area. Never any problems there. Good luck & enjoy. Don't forget your hand wipes and hand sanitizing lotion. Sorry, forgot to give you advice on Tibwetan doctor. There is usually a Tibetan doctor working at the Shechen Clinic next to Shechen monastery. There's also the Kuenphun Clinic off the kora. May consider it the best in Boudha. When I was in Kathmandu in 2008, by far the best Thangkas you could get in the Dharmapala Thangka Center located at Annapurna Arcade, Shop 3, Durbar Marg. I don't think there is an official website except this German one: http://www.thangka.de/Dharmapala/impressum.htm. We bought 4 wonderful mandalas at that shop, true pieces of art. Most thangkas you can get in various places all over Kathmandu in comparison lacked the artistic details and in some cases were obviously painted by artists without any deeper understanding of the meaning of these thangkas. By the way, another shop that has very nice thangkas displayed on their website is this one: https://luckythanka.com/. You'll find their address on the website. I have no idea if the thangkas are really all that nice once you are in their shop, but the ones online look really pretty. Which are indispensable vaccines ? Some indispensable objects in my suitcase? Also, right next door to the north down a passage way and a little hidden, there's a shop that specializes in all stone-ground pigments. Don't remember the name. I believe the previously mentioned "Garden Restaurant" is actually the restaurant called Garden Kitchen. I'd like to second that and Flavours. My favorite restaurant in Boudha has to be the Japanese place upstairs on the kora. I wanna say it was called Sakura. Images of Enlightenment has amazing quality thangkas (a lot of them in Karma Gadri style), but they're quite expensive, especially when you're on any type of budget. However, if you have the cash and devotion, go for it. Pema Chophel, are you thinking of Rincheling Thangka Gallery & Art School? That's my buddy Tashi Lama's place, and i can personally vouch for him, having commissioned custom thangkas of Shantideva and Karma Chagme over the years. No one else in Boudha had these or knew how to paint them, but Tashi had done a mural of the 84 Mahasiddhas and was able to extrapolate and embellish from a small, low-res pic of an old Karma Chagme thangka. I was there for several weeks and got to see the whole process from start to finish. Plus his prices are totally reasonable. He's a Tamang Drikungpa, so it's kinda the de facto thangka shop for Drikung practitioners. Garchen Rinpoche, Nubpa Rinpoche, Lama Thubten Nima, and Drupon Thinley Ningpo have all been there, just to name a few. I highly suggest you stop by and have some chai with him! Pemachopel in Nepal is there a Italian restaurant?! Like he said. There are quite a lot of places to stay - I was at the Rokpa Guesthouse last year - highly recommended, but there are plenty more. There are, of course, people there who will charge you too much for thankas and so on, but there is competition and good places too. My tip would be to be as clear as you can beforehand about the thanka you want, then do plenty of walking around, asking, talking to people and generally enjoying life while you home in on your source and your treasure. What to have with you? Well you can buy it in pharmacies on the main Baudha road, but just in case you get hit by violent diarrhea (as I did last year for the first time on any Asian trip) have some pills containing loperamide. You're starting to be able to find decent ones here, but it's easier to just bring one with you. Most places just sell surgical style masks, and when the suns out and the roads are dusty and dry, you definitely want something better than that.